I just dropped by the wiki; "The Business Analysts Handbook" and saw a new article posted with this as the title. Click through and read it. It's a rant by a BA who has been frustrated by their requirements management experiences recently. If you have been in this game for a while you may recognise the story. While you are there, if you have experiences or knowledge you would like to share, take a moment and put in an article. 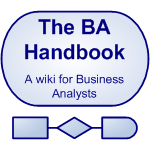 As it grows this wiki could become another useful resource for business analysts. "By the way, I really do like IT folks. It's just that sometimes I don't like the way they do things." To me, The fact that BAs and PMs see themselves as separate from IT is the biggest problem we have with projects. I'm sure this is not uncommon in the industry but it really does seem to be a key issue to be aware of. Until IT views BA’s as more then over glorified Tech Writers or PR firm there will always be a separation. In IT, a BA grows up and become a PM or a Developer, they do not even see a lead BA Role as equal to a Tech Lead, Nor do they think there should be a Manager of BA’s. IT has a myopic view of the BA because most of them use to develop software just fine without a BA “x” number of years ago so now BA’s are a necessary evil (that is not understood). Most IT organization I have dealt with has been hostile to the BA and the Business has been apathetic. In most of my past I had to fight Developers, Tech leads and Project Managers and even Business, just to do the basics of my job. PMs and BAs can sit in both business and IT. Some are palced in a third place; internal consulting departments. Whereever we are placed in an organisation it influences our view of the work and what "done" looks like. Wherever you are you face different political challenges to delivering true value. That's a big challenge for many of us and one we try to address here in sharing our writings. Thanks for the contribution Shoe!